Joel Osteen was back on CNN this week, appearing Thursday morning on “Starting Point with Soledad O’Brien.” Osteen’s new book, I Declare: 31 Promises to Speak Over Your Life , has recently hit the nation’s bookstores. The appearance of Osteen and Chopra together was a priceless demonstration of the fact that the New Thought positive thinking philosophy that drives them both can be grafted onto either Christianity or Asian religion. In the end, it all sounds the same. Chopra’s New Age spirituality and Osteen’s updated version of the word-faith movement end up as the same message, just with different trappings. 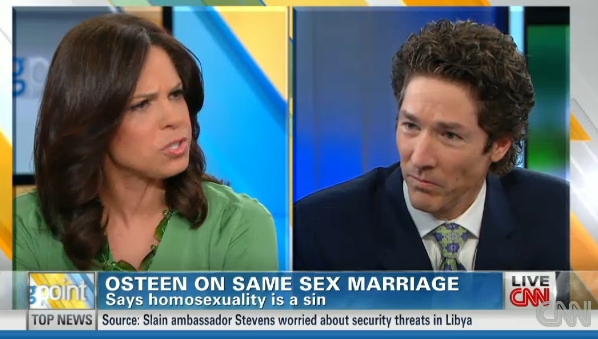 So, “good, Bible-believing people” are found on both sides of the fence when it comes to the issue of homosexuality, Osteen says. His intention is clearly to straddle that fence. As he has said previously, he affirmed that homosexuality is not “God’s best” for humanity. Even then, the words had to be put into his mouth by others, including a major homosexual activist also on the program. There, for all to see, was Joel Osteen . . . staying in his lane.